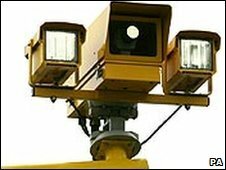 Average-speed cameras are to be used on an urban road with multiple entrance and exit points for the first time, Transport for London (TfL) says. The 84 cameras are to be installed on a 7.5-mile (12km) stretch of the A13 in east London, ready for use by next summer. They will operate between Canning Town and the Goresbrook interchange. However, the speed limit will be raised from 40mph to 50mph on a section of the route once the cameras are in place. TfL said it hoped the cameras would halve the number of people killed or seriously injured along the road. The collision rate on that stretch of the road has been almost a fifth higher than is typical of major roads in London, TfL said. Nearly 500 collisions, including three fatal and 34 serious accidents, were recorded on this stretch of road between 2006 and 2008. TfL said half of these incidents were caused by speeding. RAC Foundation director Professor Stephen Glaister said: "This is exactly the right way to target road safety: take specific action to target a specific problem. "Average speed cameras are already a familiar feature in roadworks and they have the advantage of smoothing traffic flow rather than creating the stop-start sort of driving often associated with fixed cameras. "The fact that the speed limit is actually going to be increased is an acknowledgement of this."